Lost WhatsApp Chat History on iPhone? "I accidently deleted the conversation history on my iPhone WhatsApp. Unfortunately, I have no backup files. How to restore the deleted iPhone WhatsApp chats? Help!" Deleting messages from WhatsApp on iPhone by accident could happen to anyone. Meanwhile, you may have lost WhatsApp chats after iPhone factory settings restore, jailbreak, iOS 8/7 update, damage, iPhone stuck in recovery mode, and more other scenarios. The great thing is that you can restore deleted, lost iPhone WhatsApp Chats without backup, or from iTunes backup. Below are the 2 ways in details. Restore iPhone WhatsApp without Backup: If you have no iTunes backup, or iCloud backup, you can use this mode on WhatsApp Recovery to recover deleted WhatsApp messages directly from iPhone without backup files. Unlike other tools, it never causes data loss or damage on your device. Feel free to try it. Retrieve iPhone WhatsApp from iTunes Backup: If you have use iTunes to sync or backup your iPhone, you can employ this mode to extract WhatsApp conversations from the unreadable iTunes backup file and recover all of them in readable formats. You don't need to open iTunes, or connect iPhone to computer. This will do especially good help when your iPhone is broken, damaged, lost or stolen. 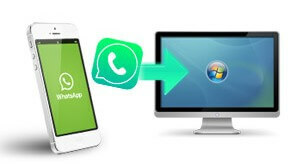 Download and install WhatsApp Recovery on your computer and do as follows to undelete your iPhone WhatsApp data after you deleted or lost them. 1. Connect iPhone to your computer with a USB cable and run WhatsApp Recovery. On the interface of this program, double-click WhatsApp Recovery. It will detect your device and display your existing and lost WhatsApp text messages, photos, videos, audios, Contacts automatically. 2. After scanning, you can freely preview all the WhatsApp data in details. Select all the deleted ones and click "Export". 3. Select a save path to save WhatsApp messages. 2. In the following windows, you can preview and recover all the lost iPhone WhatsApp chats. Do as the simple instruction tells you. Never worry whenever you deleted or lost iPhone WhatsApp messages. 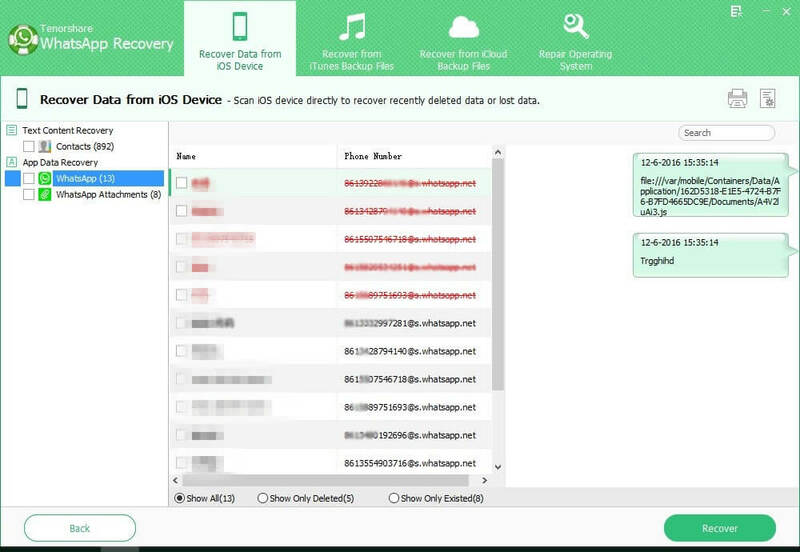 WhatsApp Recovery will help you get backup all data. If you are running OS X 10.10 Yosemite, Mavericks (10.9), Mountain Lion (10.8), 10.7, 10.6 on MacBook Pro, iMac, MacBook Air, Mac Pro, go to WhatsApp Recovery for Mac.